Our winds are positively amazing this month and last month, and the month before. Today, it was gusting beyond 25 knots at times. The waves rolling into Lac Bay were amazing. Take a look at Nic Hibdige, GBR 700. 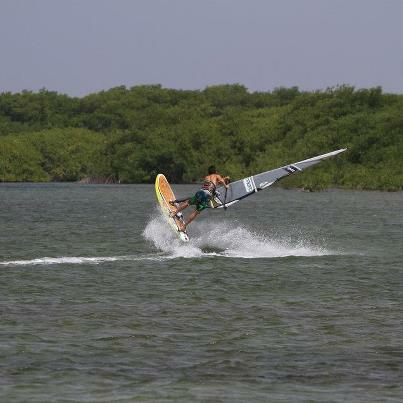 He is sponsored by Mystic, Simmer Sails, Starboard and 24-7 Boardsports. He and his super fast slalom sailor brother, Sam take on the waters of Bonaire. Nic is new school freestyle, whilst Sam is old school slalom. Today, Sam was blasting on the blue highway of Lac Bay racing / training with former Olympian, Constanstine “Patun” Saragoza. Sam has clocked 57 KPH in the UK. Today he was rocking his 5.7 TR7 and 86 ltr Isonic. This entry was posted on July 26, 2012 at 2:17 am and is filed under Uncategorized, Windsurfing. You can follow any responses to this entry through the RSS 2.0 feed. You can leave a response, or trackback from your own site.